Marcy Kirsch, age 91 died on April 8, 2019, in Stevens Point. A Mass of a Christian Burial will be held for Marcy at 11 a.m. on Saturday, May 4, 2019, at Holy Spirit Catholic Church in Stevens Point. Rev. Steve Brice will officiate. Friends and family may gather to share memories on Friday, May 3, 2019, from 4-8 p.m. at Shuda Funeral Chapel, 3200 Stanley St., Stevens Point. Visitation will continue on Saturday from 10-10:45 a.m. at the church. Burial will be held at a later date at Calvary Cemetery in Louisville, Ken. Marcy was born Mary Marcella Parker in Louisville, the second of six children of the late Dr. Joseph Skees Parker and Mary Marcella (Hayden) Parker. After graduating from Marquette, Marcy returned to Louisville for three years to work as feature writer and photographer for the Archdiocesan weekly paper, The Record. In 1952, she married Dr. Raymond P. Kirsch and moved to Rhinelander, where Dr. Kirsch practiced dentistry with his brother. In 1960 the couple moved to Stevens Point. After the youngest of their six children entered kindergarten, Marcy worked for Dr. Kirsch as his time-control executive secretary. After 25 years of marriage, they divorced. Marcy returned to her cherished field of journalism and worked as writer and editor in the communications department of Sentry Insurance. She was a freelance writer and copy editor for Motorola, Delta Dental, and TravelGuard International. She was an editorial assistant for The Journal of Wildlife Management, and coordinated the Aldo Leopold conference on the 50th anniversary of Leopold’s A Sand County Almanac. Marcy was a charter member of Sentry Toastmasters. She was a 30-year member of Center Point Chorus of Sweet Adelines, during which she wrote scripts for the choruses of “Second-hand Dream”, “Mr. Charles Bones”, “Call of the Train”, “The Second Greatest Show on Earth”, and “Beyond the Moon”. Marcy traveled extensively and wrote journals while visiting the Soviet Union, England, France, Belgium, the Netherlands, Austria, Switzerland, Germany, Poland, the Czech Republic, Ireland, Norway, Sweden, Scotland, Spain, Portugal, and Northern Africa. At age 50, Marcy enjoyed the challenge and rush of downhill and cross country skiing and scuba diving. 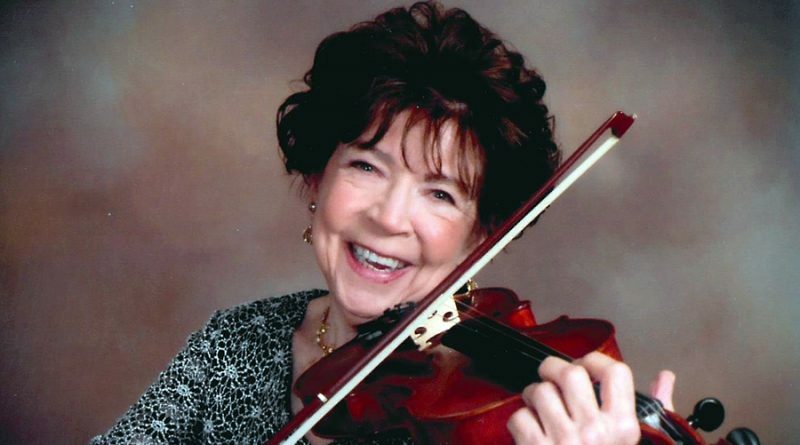 When she was 74, Marcy began her musical journey studying violin, using her father’s violin while continuing piano. In both these musical disciplines, she followed the Suzuki method where her classmates were as young as five. Marcy is survived by her three sons: Paul (Sam), Dan (Michele), Rob (Betty) all of Stevens Point; her three daughters: Mary Sutter of St. Louis, Mo., Sarah (Rick) Wilke of Amherst Junction, and Laura (Randy) Meffert of Waunakee. She is also survived by grandchildren Jeremy Kirsch, Dylan Engel, Nathan and Naomi Stowell, Anna Mae Meffert, Richard Sutter, and Eric Rhoda. She is survived by her sister, Barbara (George) Matous of Penn Run, Penn. and their seven children. She is survived by great-grandchildren Trenten and Bryanna Kirsch. Marcy was pre-deceased by the father of her children, Dr. Ray Kirsch and by her beloved Dan Coble, partner for 30 years. The family would like to thank Ann Phillip for her companionship, care & humor. Also the wonderful nursing staff in the IMC at St. Michael’s Hospital. In lieu of flowers, donations may be made to the National Tuberous Sclerosis Society in the name of her grandson Nathan Stowell.